The Mississippi River runs right through blues territory. It was the artery that carried the cotton crop from the Mississippi Delta to market in Memphis, and it was the means by which exotic crops like bananas made their way from tropical regions into the heartland of the USA. My brown-speckled pie pan from the Sixth Avenue Flea Market is the same color as the crust. Bananas weren’t the only crop to make that journey. My father grew up the river town of Quincy, Illinois. His family was in the wholesale grocery business, and their signature product was coffee that they ground themselves, but the beans came up the Mississippi River. The Kohl Grocery building that I remember visiting as a child was a multi-story red brick structure near the docks. It was fondly referred to as “the bean mill” and the whole place smelled of fresh-ground coffee. But to get back to the bananas. Mississippi Banana Cream Pie is an old-fashioned icebox pie, a hot-weather recipe. September can still be hot enough for a recipe like this to appeal, and it can be made with no baking at all if you use a ready-made graham-cracker crust from the grocery store. At my ShopRite, these are found in the same aisle with boxed cake mixes. When I made the pie recently, though, I made my own crust. Stir ingredients together and transfer to pie pan. Use your fingers to press the crumbs over the bottom and up the sides of the pie pan and to shape a nice edge. Bake the crust for 8 minutes at 350 degrees. Let it cool before you add the filling. 1/4 cup powdered sugar—this results in a very sweet filling. You can mix the first four ingredients and taste the result, then add less sugar to taste if you wish. Beat the cheese and milk together until they are creamy, add 1/2 cup whipping cream and the pudding mix and beat until everything is blended and smooth. Add all or part of the powdered sugar to reach the sweetness you like. Spoon half the mixture into the cooled crust and smooth it out. Cut all three bananas in half and peel 5 of the halves—save the last one unpeeled till you are ready to use it for the decoration. Slice each banana half into four slices lengthwise. Lay the banana slices on top of the pudding mixture radiating out from the center like spokes, except they will overlap. Spoon the rest of the pudding mixture on top of the bananas and smooth it out. Cover with plastic wrap and refrigerate for two hours or more. Beat the remaining cup of whipping cream. Use it just as it is, without sugar. The pie is sweet enough. Spoon it around the edge of the pie, making a nice border two or three inches wide. 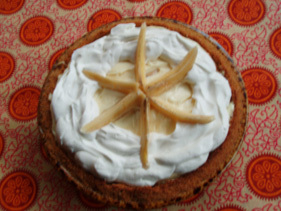 Peel the remaining banana half and cut it into decorative shapes for the center of the pie. Mine ended up looking like something you’d find on the beach at low tide, but you can do anything that strikes your fancy. Cover and refrigerate the leftovers if there are any. The pie will keep for a few days and the banana taste spreads through the pudding and becomes even more delicious and intense.